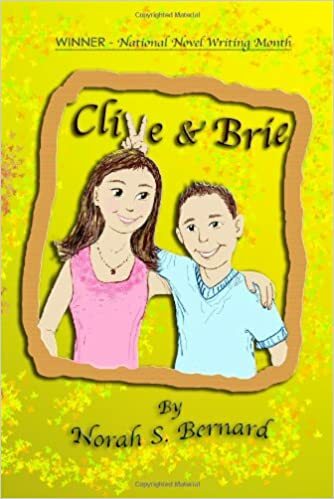 Clive is 11 and Brie is his 13-year-old sister. They experience the typical--and some very UNtypical--junior high school adventures. Clive is an internet entrepreneur who receives a "spam" email-and decides to "scam" the "spammer" by beating him at his own game. But a surprising turn of events has it working out in a way he never imagined! Brie gets caught up in her own foibles: She writes a humorous "anonymous" letter to a boy she likes--then faces real danger when she accepts an invitation from a handsome older high school boy. Their dad, Guy, finds an heirloom pistol in the attic and, according to the instruction manual, decides to clean it--big mistake! Constance, their mom, somehow gets "volunteered" to do things she really doesn't want to do--such as auditioning for a local production of Beauty and the Beast--and ending up in the lead role! It all comes together in a surprise twist of circumstances on opening night! they needed to be courteous. “Yes, that was me,” she said, and Brie thought, that was I, but didn’t say anything. Never correct an old person. The saleslady took another long drag off her cigarette, and her cheeks sunk in––then she tipped her head back slightly and blew the smoke out with her jaw jutting out a little. Then she looked over at the entrance to the mall. Shannon took that as a hint that the lady didn’t want to be sociable, so she said, “Well, thanks for helping us out in there! letter caused for you.” Constance took her husband’s hand and also stood up, a not-so-subtle hint that the meeting was over. Mr. Gruenswald was not having any of it, though. “What are you going to do about her?” he said in a strident tone, pointing to Brie, who shrank back into her seat as though he had hurled a knife into her chest. “Are you going to just let her get away with this?” Guy had to assimilate this for a second, trying to place it all in perspective. The man had lost his daughter.